Well, the end of 2018 is a bit of a milestone for this blog. I am the end of five years of my ten year Shakespeare New Year Resolution. Half way through. So as well as rounding up the last year, I’m doing a little more thinking about the project as a whole – what it has meant to me, and what I might still try and do with it. Not all of that thinking will necessarily make it into this blog – but rest assured it is happening! So, this year I started my Ten Year Shakespeare New Year Resolution, to see all of Shakespeare’s plays staged. And also, because I am as swayed by peer pressure as the next person, I started a blog to record the productions I’ve seen. And because I soon realised that posting only when I saw a show would lead to a very sparse blog, and because I like to waffle on, it has snowballed into a bit of mishmash of random, vaguely Shakespeare-related posts which take in reviews, quotes from the plays, productions I wish I’d gone to, and a bit of vaguely informative history. In the four-and-a-half months I’ve been doing the blog, I’ve notched up an impressive 39 posts. Wow. Sorry about that. My most popular post was my review of The Winter’s Tale (hello Twitter reblogging – I’m calling it the day I went semi-viral.) My least popular posts were on Shakespeare in Love, and announcing ticket purchases. Duly noted, guys. 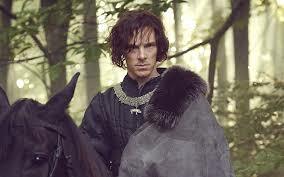 I really enjoyed The Hollow Crown this year, and am eagerly anticipating the next round. Yay Benedict Cumberbatch! I already have tickets for Much Ado About Nothing, and I’m trying to round up a posse to go and see an Othello at the Rose Theatre in February. Afterwards, we’ll see what comes up! I have more in-depth posts planned, and I really should get out to Stratford if I can. And of course I am hoping to go viral enough to get a ticket to Hamlet. Dream big, people, and happy 2015!